The role of the professional female playwright was still very much a work in progress in the English theatre during the late 18th Century. As a novice playwright, established novelist Frances "Fanny" Burney wanted to create a comic masterpiece for the stage--an aspiration she referred to in her journals as her "golden dream." But there were no models for her to look to for the type of satirical, female character-driven work she wanted to create. In the absence of any guidance, she created characters that were biting, satirical portraits of other women in a work called The Witlings. When she realized, however, that this play might damage the work done by the increasingly powerful Bluestocking Circle (which she admired) and in particular its famous salon hostess, Lady Elizabeth Montagu, she made the decision to suppress her own play. The decision would haunt her for the rest of her life, and she would never regain the writing momentum or easy opportunity for production that she gave up by abandoning this first play. Nevertheless, her choice, made at a time when female playwrights were not looking critically at their work to evaluate how it might be perceived by other women, portray other women, or affect the public perception of women as literary authorities, makes a significant feminist statement. 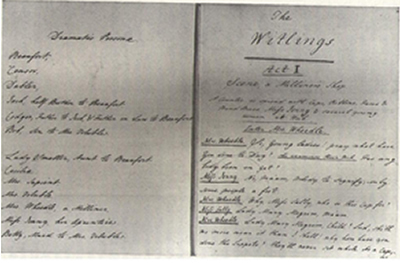 Burney's first play, The Witlings, was written in May of 1779, less than five months after Sheridan's invitation. It is a social satire in which Lady Smatter, the patron of a literary salon known as the Esprit Party, forbids her dependent nephew, Beaufort, to marry his fiancée Cecilia, also Smatter's dependent, when Cecilia loses all of her fortune through the mismanagement of an incompetent banker. Eventually, Beaufort's friend Censor, a respected intellect of the day, resolves the situation, extorting Smatter's blessing on the marriage by threatening to publish a vicious verse lampoon he has written about her greed and ignorance. As if feeling somewhat ashamed of recording this, Burney immediately qualifies it by saying, "Mrs. Montagu is in very great estimation here, even with Dr. Johnson himself, when others do not praise her improperly. Mrs. Thrale ranks her as the first of women in the literary way." Even this apology admits partiality to Johnson's opinion as she insists there is "proper" praise for Montagu and "improper" praise and Johnson could be trusted to distinguish between them. Johnson's attempt to draw a comparison between himself as a young writer, attacking the reputations of leading male intellects of the day, and young Burney launching a similar attack on prominent female intellects shows Johnson's lack of understanding about the position of a young female writer in late 18th-century England. His opinion doesn't allow for the fact that women's literary relationships of the time were, by necessity as much as by natural feminine inclination, collaborative and communal. His world view rejects the Blues's ideal conception of a literary society founded on principles (in Deborah Heller's words) of "a social bond consisting in shared speech or communication." Instead, he persuades Burney that she is in a competitive relationship with her most powerful female patron and advocate. If Montagu was in the habit of referring to herself mockingly as a "witling" that may have been an inspiration for Burney's title. Burney's relationship to money is clearly expressed in her writing, particularly her characterization of Cecilia in The Witlings, and it is a possible partial explanation for her resentment toward Montagu. Burney wrote a novel called Cecilia shortly after the suppression of her play in which the title character is clearly a more fleshed out version of The Witlings's Cecilia. The Cecilia in Cecilia and Evelina in Evelina both possess fortunes by inheritance that they did not earn. Like The Witlings's Cecilia, they lose everything through the incompetent administration of one, or a series of, men. In Burney's writing, women did not manage money, especially not on the large scale that Montagu managed her family fortune. In her work, and decidedly in The Witlings, Burney vilifies the rich. Montagu was actively involved in improving labor practices at her family coal mines, investing intelligently in land management and financial planning for other family members. But Burney's parody reduced the idea of a wealthy woman to a jealous, superior, greedy and self-satisfying caricature. Satirically charging the greatest of the Blues with "blaspheming" the poets and "having no ideas" undermined the Bluestocking Circle's ambitions to champion women's educational and literary potential. The lead character Cecilia is firmly a Virgin/Goddess, but she also fulfills another female stereotype very common in Burney's work, "the Victim." She is made penniless by the banker who loses her legacy and is then thrown out of Lady Smatter's house for being destitute and, therefore, an undesirable match for her nephew. Ultimately, Cecilia's salvation comes at the hands of men through the defeat and humiliation of another woman. In this play, the pretentious, self-promoting female who wields masculine powers of wealth and social influence (Lady Smatter) must be destroyed so that the Virgin/Goddess (Cecilia) can fulfill her patriarchal purpose and marry Beaufort at the conclusion of the play. If you insert Lady Montagu into the role of Lady Smatter in this comparison, then the message is clear: the Bluestockings with their pretentious ambitions to wield masculine-type influence in the world of literature must be thrown down so that the patriarchal monopoly on literary affairs can be maintained. Burney spent her last twenty years going through her manuscripts, voluminous diaries and correspondence and left behind only one manuscript of The Witlings (in the Berg Collection). Darby maintains that notes in the margins of the manuscript include cuts to the text that were never made and might have been in response to the criticisms around the satire. However, my own examination of the manuscript turned up no conclusive evidence of marks indicating possible alterations to eliminate offensive comedy. The notations Darby refers to are a series of X's in pencil that the librarian at the Berg Collection says cannot be positively attributed to Burney (although there is no record of annotations from any other source). The notations, which are only present in a short section of Act IV, mark passages of dialogue that should be delivered as asides by the actor. The section of Act IV that Darby regards as a major cut features bracketed dialogue and a single X. This might be a cut of extraneous dialogue at the beginning of Censor's entrance, but the X's do not indicate cuts anywhere else in the manuscript-- they only mark asides (or in one instance seem to be merely doodles). The marked section is the only place where there is overlapping dialogue by more than two people in the play, so the annotations may just have been an attempt to call attention to the overlap which is not indicated by stage directions. It is clear, in any case, that the pages of Act IV are unevenly trimmed. The first two pages are at least a quarter inch shorter than the rest of the act. The majorityof the rest of the pages are curled at the edges, suggesting they were all once part of the same folded folio (Acts I and II are preserved, uncut, in similar folios). And this indicates that there were very likely revisions made to the Act from the original. But the purposes of the revisions aren't clear. Burney would eventually write seven plays, but see only one of them performed, Edwy and Elgiva (1795), which was savaged by the critics, ending what might otherwise have been a notable playwriting career. Of her novel-writing career, James E. Person Jr. says, "Burney is considered a significant transitional figure who employed the methods of Samuel Richardson and Henry Fielding to create a new subgenre that made possible the domestic novels of Austen, Maria Edgeworth, and countless other successors." Given her impressive innovations in nondramatic literature, Burney might well have become a leading dramatist if she had been allowed room to grow as a dramatist. Darby contends that in later life Burney regretted the decision to suppress The Witlings. Notes Burney made on her correspondence characterize her father's and Crisp's critique as "severe" and called attention to the praise the script received from other reviewers. But the decision undoubtedly promoted women's increased participation in the arts and culture, or at least prevented serious setbacks and obstacles. Perhaps most importantly, it preserved her reputation as a mentor for the next generation of women writers. Jane Austen, a subscriber to Burney's serialized fiction, was enormously influenced by Burney's satires. Pride and Prejudice owes its name and elements of its plot to Burney's novel Cecilia, which was written just after The Witlings and shares several of the play's characters and storylines. 1. Frances Burney D'Arblay, Diary of Frances Burney D'Arblay, p. 377. 2. Janet Todd,. The Sign of Angellica: Women, Writing and Fiction, 1660-1800, p. 273. 3. Frances Burney, Journals and Letters, pp. xix-xxi. 6. Ibid., pp. xvi, 100. 9. Deborah Heller,“Bluestockings and the Public Sphere,” p. 59. 11. Sue-Ellen Case. Feminism and Theatre, p. 46. 12. Burney, Journals and Letters, p. 101. 15. Burney. Journals and Letters, p. 101. 17. Deborah Heller, "Bluestocking Salons and the Public Sphere," p. 62. 18. Ibid, p. 72. Quoted from D'Arblay, Diary of Frances Burney D'Arblay, vol I, p. 364 (brackets Heller’s). 20. Elizabeth Robinson Montagu, 1720-1800, "Letter from Elizabeth Robinson Montagu to Elizabeth Carter, June 06, 1758," p. 374. 21. Peter Sabor and Geoffrey Still, "Introduction" to The Witlings, The Woman-Hater, p. xxxiii, note 19. 22. Barbara Darby. Frances Burney Dramatist, p. 24. 23. Elizabeth Child, “Elizabeth Montagu, Bluestocking Businesswoman,” p. 154. 25. Case. Feminism and Theatre, p. 6. 26. Aristotle, Poetics, Else trans., Else attributes this translation to Kassel in his note (105) to lines 54a24-6, p. 99. 28. D'Arblay, Diary of Frances Burney D'Arblay, p. 263. 30. Darby, Frances Burney Dramatist, pp. 24-25. 31. D"Arblay, Diary of Frances Burney D'Arblay, p.436. 35. Burney, Journals and Letters, pp. xxviii – xxix. 36. Darby. Frances Burney, Dramatist, p. 25. 38. A. Henry W. Thornton and Albert A. Berg Collection of English and American Literature. Conversation with the author. 39. Darby,Frances Burney, Dramatist, p. 43. 40. James E. Person Jr., Burney, Fanny - Introduction. Nineteenth-Century Literary Criticism. Vol. 54, p.1. 41. Darby. Frances Burney, Dramatist, p. 25. 42. John Wiltshire, “The inimitable Miss Larolles”: Frances Burney and Jane Austen, p. 218. 43. 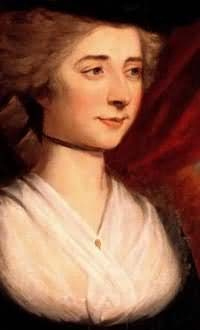 Frances Burney. Cecilia, p. 930. Aristotle. Poetics, trans. Gerald F. Else, Lansing, MI: Ann Arbor Paperbacks, The Michigan University Press, 1970. Burney, Frances. Journals and Letters, London: Penguin Books, 2001. Burney, Frances. Cecilia, Oxford: Oxford University Press, 2008. D'Arblay, Frances Burney, 1752-1840, Diary of Frances Burney D'Arblay, September, 1778, in Diary and Letters of Madame D'Arblay, vol. 1-6: 1752-1840. Barrett, Charlotte Frances, ed. London, England: H. Colburn, 1842. Case, Sue-Ellen. Feminism and Theatre, New York, NY: Palgrave MacMillan, 1988. Child, Elizabeth. “Elizabeth Montagu, Bluestocking Businesswoman,” Huntington Library Quarterly Vol. 65, No. 1/2, Reconsidering the Bluestockings, University of California Press (2002), pp. 153-173. Darby, Barbara. Frances Burney Dramatist, Lexington, KY: The University Press of Kentucky, 1997. Heller, Deborah. “Bluestocking Salons and the Public Sphere,” Eighteenth-Century Life, Volume 22, Number 2, May 1998, pp. 59-82. Johnson, Samuel. A Dictionary of the English Language, London: Printed for A. Millar, 1766. Montagu, Elizabeth Robinson, 1720-1800, "Letter from Elizabeth Robinson Montagu to Elizabeth Carter, June 06, 1758," in The Letters of Mrs. E. Montagu, With Some of the Letters of Her Correspondence, vol. 4. London, England: T. Cadell & W. Davies, 1809. Person Jr., James E. Burney, Fanny - Introduction. Nineteenth-Century Literature Criticism. Vol. 54. Gale Cengage, 1996. Accessed electronically through the Gale Cengage database Jan 10, 2011. Rogers, Katherine, ed., The Meridian Anthology of Restoration and 18th Century Plays by Women, New York, NY: Penguin Group, 1994. Sabor, Peter and Geoffrey Still, eds. The Witlings, The Woman-Hater, London: Pickering & Chatto Limited, 1997. Todd, Janet. The Sign of Angellica: Women, Writing and Fiction, 1660-1800. New York: Columbia University Press, 1989. Wiltshire, John, “‘The inimitable Miss Larolles’: Frances Burney and Jane Austen,” in A Celebration of Frances Burney, Lorna J. Clark, ed., Newcastle, Cambridge Scholars Publishing, 2007.